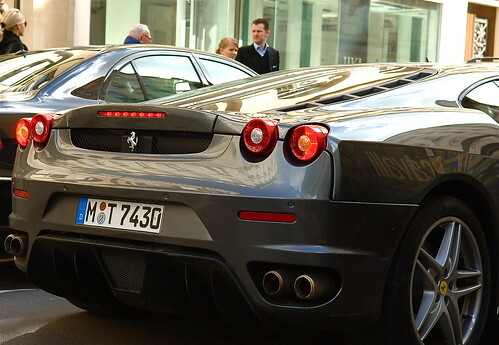 The F430's chassis is heavily based on its predecessor, the 360. Also, the next car that will be after the F430 will be the F450. Internally, both cars are referred to with the same model number (F131), though the F430 has the Evoluzione tag attached to show that it features some major changes. Internally, the car is simply known as the "Evo". The MSRP for a Ferrari F430 is between $168,005 - $227,000 in the United States. The F430 is sold starting at about £120,000 in the United Kingdom, approximately €175,000 in the European Union and $389,000 for the base model to $450,000 for the Spider F1 Sequential in Australia. The body has been redesigned to be more curvaceous and aerodynamic. Although the drag coefficient remains the same, downforce has been greatly enhanced. A great deal of Ferrari heritage is found in the car: at the rear, the Enzo's tail lights and interior vents have been added. The car's name has been etched into the Testarossa-styled driver's side mirror. The large oval openings in the front bumper are reminiscent of Ferrari racing models from the 60s, specifically the 156 "sharknose" Formula One car and 250 TR61 Le Mans cars of Phil Hill. Along with a restyled body, the F430 features a 4.3 L V8 petrol engine derived from a shared Ferrari/Maserati design. This new powerplant is a significant departure for the F430's line: The engines of all previous V8 Ferraris were descendants of the Dino racing program of the 1950s. This fifty year development cycle comes to an end with the entirely new 4.3 L, the architecture of which is expected to replace the Dino-derived V12 in most other Ferrari cars. The engine's output specifications are: 360.4 kW (483 hp) at 8500 rpm and 465 N·m (343 ft·lbf) of torque at 5250 rpm. The F430 will reach a top speed of 197mph. The brakes on the F430 were designed in close collaboration with Brembo. The result has been a new cast-iron alloy for the discs. The new alloy includes molybdenum which has better heat dissipation performance. Another option Ferrari is providing are carbon-ceramic discs. Ceramics have much higher resistance to heat and brake fade than metals, the F430's brakes offer not only good performance but also a longer lifespan. Ferrari claims the brakes will not fade even after 300-350 laps at their test track. The F430 includes the E-Diff, a computer-controlled limited slip differential which can vary the distribution of torque based on inputs such as steering angle and lateral acceleration. Other notable features include the first application of Ferrari's manettino steering wheel-mounted control knob. Drivers can select from five different settings which modify the vehicle's ESP system, "Skyhook" electronic suspension, transmission behavior, throttle response, and E-Diff. The feature is similar to Land Rover's "Terrain Response" system. The Ferrari F430 was also released with exclusive Goodyear Eagle F1 GSD3 EMT tires. "A car with such performance needs to be equipped with the best tires on the market," said Jean Jacques Wiroth, European director of Original Equipment Sales and Marketing for Goodyear tires, adding "we are proud that Ferrari chose the Goodyear Eagle F1 with run-flat technology." The Eagle F1 GSD3 has a striking V-shaped tread design and OneTRED technology. Car and Driver magazine found the car's performance worthy of the Ferrari heritage, and recorded a 3.5 sec 0-60 mph acceleration run in the F430 This makes it the third-quickest Ferrari road car ever made, after the Enzo and the 599 GTB. That being said, the 3.5 second 0-60 run was made on a European spec car, which has launch control, a feature designed to help launch the car from a standing start at high RPMs. Much like the E-Diff and the manettino, the launch control is a technology borrowed from Ferrari's Formula 1 racing program. The launch control is unavailable in U.S.-spec F430s, presumably due to liability issues. On the BBC Top Gear TV show, shown on the 17 July 2005, The Stig achieved a Power Lap time of 1:22.9. While the laptime was 0.89 seconds less than a Lamborghini Murciélago, the F430 was slower than the 360 Challenge Stradale at 1:22.3. The slower lap was blamed on the F430's Bridgestone tires supposedly having less grip than the Challenge Stradale's Pirelli's. Top Gear's Jeremy Clarkson has commented on the F430's handling being absolutely brilliant, a marked improvement over the 360; he claimed that Ferrari holds that "even the most butter-fingered, incapable driver could drive the F430 around their test track only one second slower than the most skilled test driver". He has in fact proclaimed, on more than one occasion, that the Ferrari F430 is "just about the best car I've ever driven", a status he previously attributed to the F355 (but never the 360). The car develops about 300 kgf (2.9 kN) of downforce at top speed (without rear wing).